Central block of Detroit Veterans Memorial Eagle. 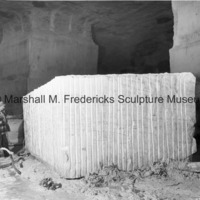 Vermont marble - 74 tons. The Victory Eagle on the facade of the Veterans Memorial Building in Detroit is 30 feet high and projects 4½ feet from the wall in high relief.